TYLER, TX –One lucky customer in every Brookshire’s Store will win in the Big Green Egg® Giveaway which begins May 25 and runs through June 21. The prize includes a large Big Green Egg® outdoor cooker, tropical mahogany large table, a bag of Brookshire’s charcoal and a $50 coupon for Certified Angus Beef products. Total retail value of prize package is $1,958. Customers will earn one chance to win for every dollar they spend on participating products with a Thank You Card. Participating items will be identified with a special shelf tag, and customers will receive a message at the bottom of the receipt informing them of the number of chances earned in each transaction. 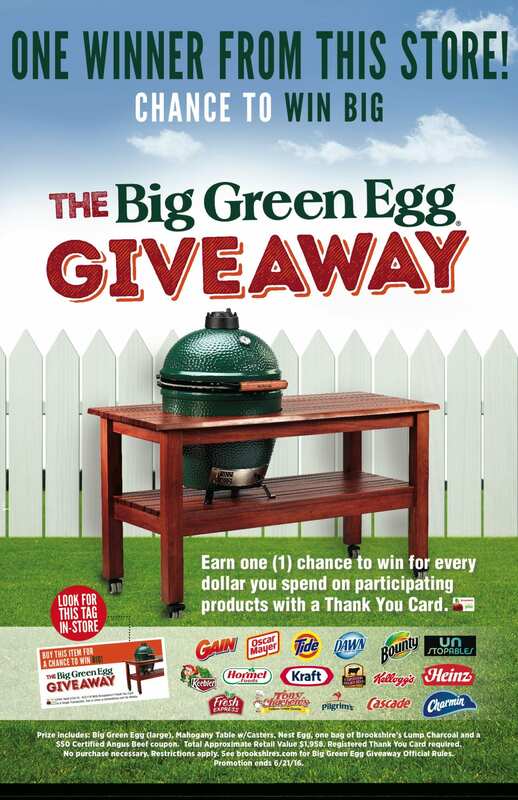 At the end of the promotion, each of the 117 Brookshire’s stores will contact the specific winner from their location to award the Big Green Egg® prizes which will be on display in the stores during the program. Official rules and full details are available at brookshires.com.